Major-General Johnson was a Companion of the Order of the Bath (CB). He held the Distinguished Service Order and Bar (DSO) and the Military Cross (MC). 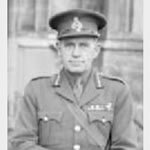 From 1928-32 he commanded the 2nd Battalion, North Staffordshire Regiment; Commanding the 12th (Secunderabad) Infantry Brigade from 1933-36; from 1938-1940 he commanded the Fourth Division, which followed by becoming a the General Officer Commanding Aldershot in 1940. He became the Colonel of the South Wales Borderers 1944-49. On 4th November, 1918 at Sambre Canal, France the 2nd Infantry Brigade, to which the second Battalion of the Royal Sussex Regiment formed part, was ordered to cross by the locks south of Catillon. The position was strong and the assaulting and bridging parties were halted on arrival at the waterway 100 yards from the Canal by a heavy barrage. At this point Lieutenant Colonel Johnson arrived and personally led an assault but heavy fire again broke up the attack. He reorganised the assaulting and bridging parties and this time effected a crossing but the success of this dangerous operation was entirely due to his splendid leadership..